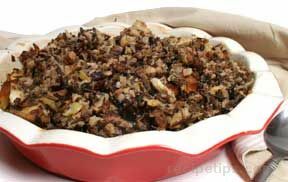 Stuffing and dressing are traditional Thanksgiving favorites. View our assortment of savory selections for that perfect recipe to accompany your holiday feast. 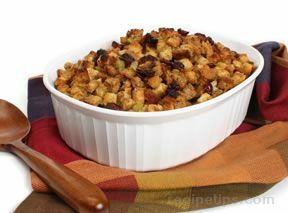 Our collection of stuffing and dressing recipes are made with a variety of different types of bread and other ingredients. 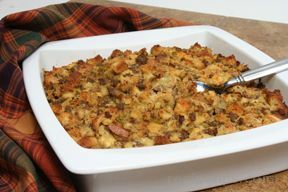 Whether you prefer a simple bread stuffing or one that is flavored with sausage or fruit, we have a recipe that will be just right for you and your family. 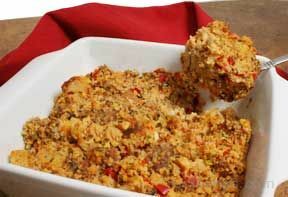 "The same recipe can be used as stuffing or dressing. The only difference between the two is how they are cooked. 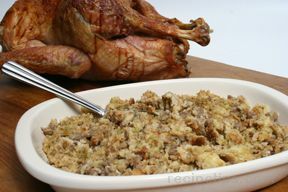 Stuffing is baked in the turkey or chicken and dressing is baked in a separate baking dish. It is recommended that that it is cooked outside of the turkey for safety reasons. Before baking the stuffing in the turkey, review the Safety Tips you should be aware of when using this method." 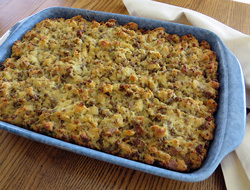 "KiyLynn, your family will love the Basic Bread and Sausage Dressing recipe. 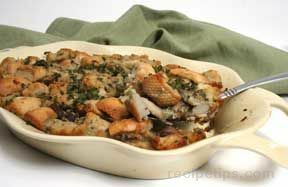 I made it last year for Thanksgiving and everyone wanted the recipe. 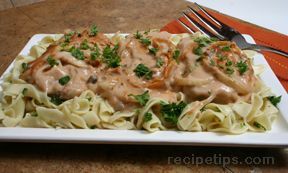 I am debating on making it again or trying the Cranberry Apricot dressing for something a little different. Good luck!" "First time making dressing! Mom usually makes it but I said I wanted to try this year. 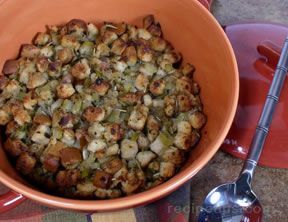 I think I will try the Basic Bread and Sausage Dressing recipe. It sounds similar to mom's dressing. She may have to come over and offer advice. I hope it turns out because our whole family loves dressing." "Great looking dressing recipes. We love dressing and my husband usually helps me with the dressing for Thanksgiving. I will have to try to talk him into using one of these recipes this year. 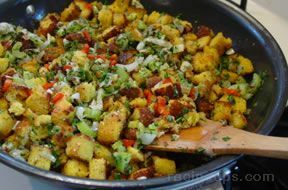 Maybe we will have to make two, our traditional and the Southwestern Style Cornbread recipe shown here sounds like an interesting dressing recipe to try."